Since DoubleLine Capital's Jeffrey Gundlach called what appears to have been the top of a more than 30-year bull market in bonds back in the summer of 2016, the company has established itself as one of the most respected thought leaders in the world of fixed income. But while Gundlach is widely seen as the public face of the firm, his co-CIO Jeffrey Sherman has also found success running the firm's strategic commodity fund, where he has developed strategies that focus on baskets of commodities that tend to trade in backwardation and contango, allowing the fund to pick up carry as the firm rolls over its positions from month to month. But a few months back, the firm changed its view and now believes that, as long as the 30-year stays under 3.22%, chaos in both equity and bond markets will be contained - at least for the time being. In this week's interview on the Macrovoices podcast, Erik Townsend discusses with Sherman why he and Gundlach now see the long end as the new key factor across markets. As Sherman explains, they don't see 3.22% as a change in their view, but rather as a sign that the long end is corroborating moves seen in other areas of the curve, and that a breakout might soon arrive. But, during this whole time, the 30-year has really double topped in yields or triple topped in yields – at 3.22 a couple of times. Now within about ten trading days ago or so, we did actually settle above 3.22. So all the phones were ringing. Everybody’s asking what does this mean? You know, it closed at 3.24 – is this the telltale sign? And from technical analysis you wait for confirmation. You wait for a couple of days. We’ve always said, like, is it 3.25? 3.30? Give it a little bit of wiggle room because of the length of duration and how painful that price move is. So it did not confirm in the next – we went below it and we’ve been below it since. Now, I’d say the world has changed over the last 10 or so calendar days. We had the resurrection of risk once again, through the BTP market and the likes, but we’re holding on the 30-year because it’s the only one that really hasn’t sat out this technical trading range. The one thing about the technicals, if you look at the shelf or the next area where it can go to, it’s roughly that 3.97 taper tantrum. So, again, we’re waiting for that long bond to corroborate the move. So far, it was kind of the false positive. It didn’t really hold. And you’ve seen yields roughly about 15 to 20 basis points lower than they were a couple of weeks ago. Commodity traders often look at positioning as it's laid out in the weekly Commitment of Traders reports as key indicators of how commodities might trade in the coming days or weeks. But one key difference between commodities and Treasurys is that the spot market in Treasurys is much larger when compared to the futures market. But despite this difference, Sherman argues (as others have on this blog in the recent past) that shifts in positioning often can reliably predict short squeezes in spot, and that the CFTC data are still relevant, despite the delay in their release. Most recently, Sherman used the data in the week after Memorial Day Weekend to determine that the drop in global rates was the result of a risk-off sentiment creeping back into markets. Now, given the rally we saw in rates in German bunds, the selloff massively in BTPs before the Memorial Day weekend, we expected there to be some form of short squeeze behavior there going on. One, you don’t really want to be short going into the long weekend. There’s all this risk percolating, three days to unwind it, so maybe I’ll just kind of flatten myself out. And then, given the behavior of the risk-off appetite that you saw that Tuesday morning post Memorial Day here in the US, you say that – okay, it felt like it was running across the curve, maybe it isn’t as much a short squeeze. So we get the CFTC last Friday and the report came out and the positioning seemed just as long on the short side as it’s been historically. So what we find there is it didn’t have all the makings of a short squeeze. If you reflect upon it, seeing how the curve moved, it did feel like a more risk-off type of appetite and that rates were somewhat responding to that. So, yes, I do agree with you that’s extreme positioning. One thing you’ve got to think about in the bond market is that, as you’re short a bond because you have to pay the carry, you have to pay the yield on it. The more right you are the more expensive that becomes over time to hold that position. So with a sideways type market, usually in yields it tends to flush out some of these short positions. Because, ultimately, just the cost of carry and not having any price movement to offset that negative carry can be problematic. Circling back, Townsend decided to confront Sherman with some questions about the technicalities of managing his macro-driven commodities fund. One factor that Townsend says he often sees among commodities managers is that they often don't understand the technicalities of concepts like contango (where each successive contract is priced higher the further they are out the curve) and backwardation (when the front-month is priced higher than contracts further out the curve). Sherman runs a strategy that seeks to divide commodities into baskets based on both of these traits. Because, what else would you expect a bunch of bond guys running commodities funds to do if not look further out at the curve? Typically a contango contract means you have an oversupplied type of market that you’re trying to incentivize consumption today, so pulling down that front price for instantaneous consumption. And the converse is true when it’s in backwardation. Historically, that signals that you have a tighter type of market that you’re trying to penalize people for consumption today. If you can defer that consumption it’s cheaper. So what we did is we worked together with someone in developing a basket or an index of exposures that focuses on things that tend to trade more in backwardation than not. Now, understanding that, you’re not looking contemporaneously at the curves to make that assessment. You are using back testing, you’re using history to think about it. But you’re also coming up with a structural rationale of why that should be, or at least better than other parts of the market. What we ended up doing was launching a strategy that uses a backwardation-focused index. So we choose 11 commodities: roughly a third in the energy sector, a third of the dollar exposure within metals (and that’s going to be industrial metals, not precious because precious should trade in contango structurally), and then some of the agriculture and livestock to round up those positionings. So a third, a third, a third. Finally, Townsend confronts Sherman with a question that has puzzled DoubleLine and many other bond funds in recent months. Namely, how does one rationalize a view that sees higher rates 6-to-12 months out with a view that we're not too far away from recession. Sherman offers a response that's strikingly similar to a position put forward by former Fed Chairman Ben Bernanke last week (which he in turn aped from Bridgewater Capital). and that response is: The market will in essence find a temporary reprieve thanks to the influx of fiscal stimulus currently being digested by the US economy. But once the market digests the new issuance and the Fed continues hiking rates and allowing bonds on its balance sheet to roll off, eventually this will send yields higher even if this coincides with the end of the business cycle and the first rumblings of recession. Maybe it’s that the tail wags the dog here. 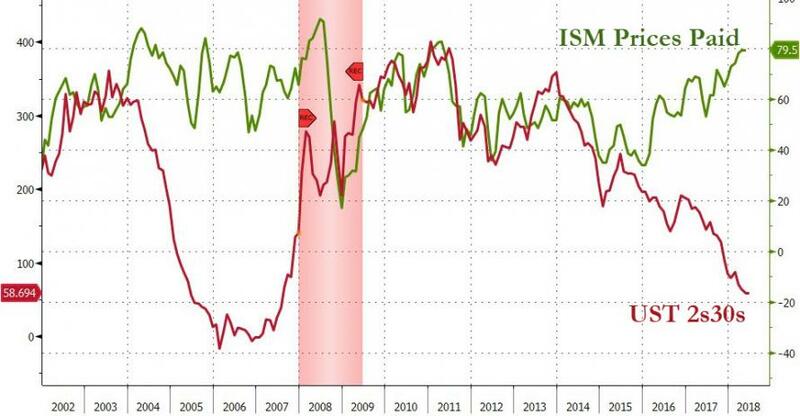 What it is is the recession indicators aren’t flashing extreme warning signals to us at this stage. In fact, very few are. Yeah, the yield curve is a little flat. Historically, if you go through when 2s and 10s goes inside of 50, it typically ultimately crosses zero. And we know that, historically, when we’ve crossed zero that’s been a recession. Maybe it’s a little bit different this time. Maybe it takes a bit longer. There’s nothing that says that a strictly monotonic decreasing function that takes you straight to zero through that 50 – it bounces around. Sometimes it bounces around for a year or so. It’s one of the things that puts us on warning. And so there happens to be a disconnect. That’s why we’re focused on the 30-year right now. There’s a really big disconnect over the long-term growth and inflation prospects, of being talked about in the marketplace, but the long bond is really not buying into it. So the rest of the curve is saying, look, if we’re going to put pressure on the front end, it sounds like Treasury finance is going to happen front to belly, it’s not really clear what Mnuchin’s plan is for all of the issuance this year, especially as you get this new supply. And so, ultimately, it’s just somewhat bearish for rates, just on the fiscal side of the equation. And yet on the technicals of the Fed’s balance sheet, there’s a lot of bonds that have got to be digested. And, on top of that, you have the corporate bond market, you have the international markets. There’s a lot of debt that needs to hit the markets for the next year or so, which should put pressure on global rates, regardless of the positioning. Ultimately, it could become recessionary and you get the rally there. But we think that you have pain first and that’s what causes that chain reaction.